Address by His Excellency Evo Morales Ayma, Constitutional President of the Plurinational State of Bolivia at the General debate of the 67th Session of the General Assembly of the United Nations (New York, 25-29 September and 1 October 2012). 2. Crisis of civilization – world government, capitalism, socialism, community, culture of life. 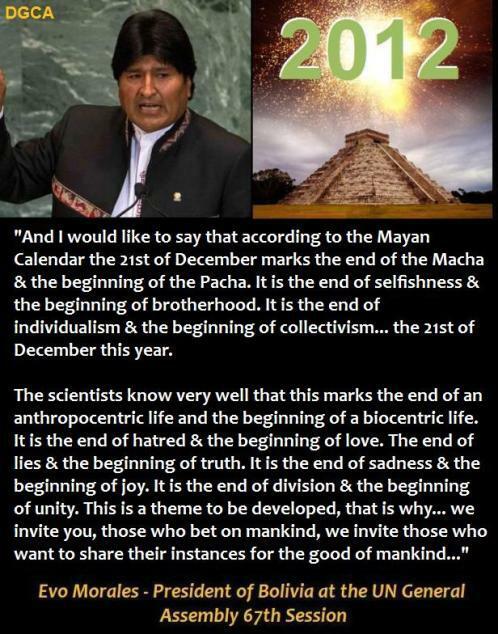 community learning, the new human being, a holistic approach, the end of patriarchy, self knowledge, awakening, and of course health – which is so important.-And I would like to say that according to the Mayan Calendar the 21st of December marks the end of the non-time and the beginning of time. It is the end of the Macha & the beginning of the Pacha. It is the end of selfishness & the beginning of brotherhood. It is the end of individualism & the beginning of collectivism… the 21st of December this year. -We have an obligation as delegates… we have to think about how to shoulder the responsibilities and this means… putting an end to powers – we are not at a time of continuing to praise the powers.